NETWORK FINALS: BIG BROTHER gained 0.1 in final numbers. CABLE HIGHLIGHTS: Showtime benefited a bit from the lack of HBO competition, as RAY DONOVAN climbed 0.05 to 0.33 and ROADIES was up 0.04 to 0.11. 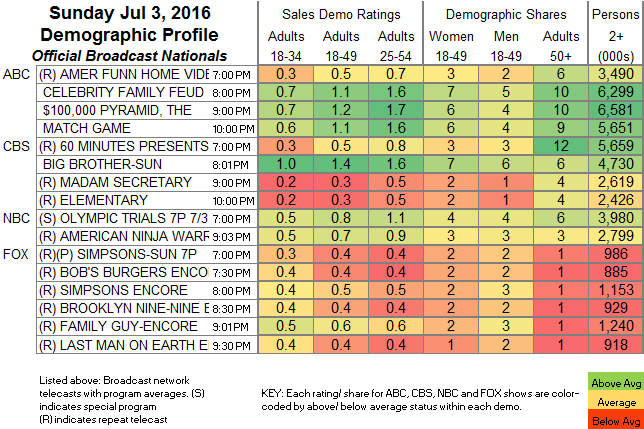 On AMC, PREACHER edged up 0.02 to 0.51, and RIDE WITH NORMAN REEDUS ticked down to 0.18. On TNT, THE LAST SHIP dropped a heavy 0.16 to 0.41, and MURDER IN THE FIRST lost 0.06 to 0.22. USA’s MOTIVE gained 0.04 to 0.22. THE JIM GAFFIGAN SHOW, preempted last week, returned to TV Land at 0.12. CMT’s STILL THE KING rose 0.02 to 0.11. On the unscripted side, E!’s KEEPING UP WITH THE KARDASHIANS topped the night, up 0.16 to 0.70, and WAGS was up 0.04 to 0.32. ESPN’s afternoon FRANCE VS. ICELAND EURO 2016 match was at 0.64, and a primetime MLB game was at 0.34. On Food Network, FOOD NETWORK STAR lost a tick to 0.46, DINERS, DRIVE-INS & DIVES was at 0.29, and GUY’S GROCERY GAMES was at 0.26. 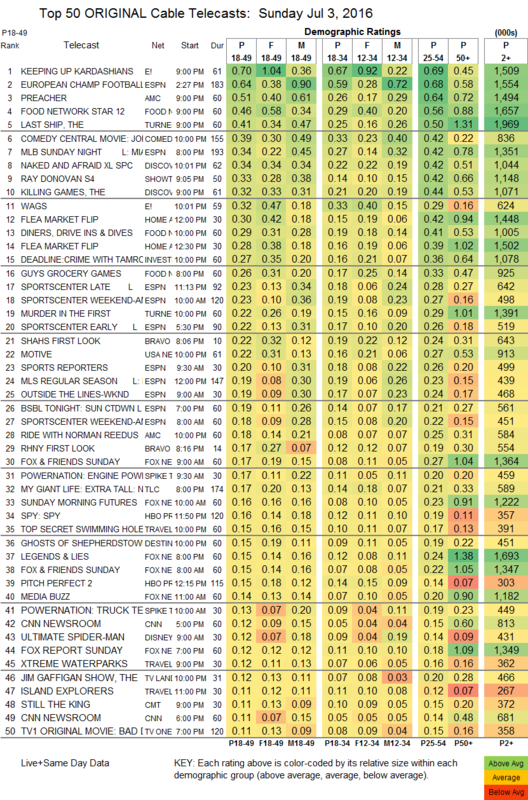 Discovery’s NAKED & AFRAID returned post-SHARK WEEK at 0.34, with THE KILLING GAMES at 0.32. HGTV’s afternoon FLEA MARKET FLIP was at 0.30/0.28.